Almotaz Khedrou fled the civil war in Syria in 2013. He was escaping mandatory military service in President Asad’s army, the same army that, in his opinion, was destroying his country. His family’s grocery store in Damascus – their livelihood – was bombed in an airstrike, so his parents sold one of their cars to pay for a passport and smugglers to take him across the border to Lebanon. In some ways Almotaz’ story is similar to that of millions of other Syrians: he needed to leave, and he knew exactly where he wanted to go. Four years later and 28-years-old now: he has been granted asylum, he is married, he has a one year-old baby, and he just opened his second restaurant. In many ways he is a success story. But unlike most who have left Syria behind over the past six years of civil war, he did not stop in nearby Lebanon or Turkey, nor did he dream of refuge in Europe or North America. Almotaz would spend his first year outside of Syria on a relentless journey to reach Colombia. Colombia is not known as a destination for refugees, or even significant flows of migration. Outside of the country, some may know it for its coffee or beautiful beaches, but it is likely known best for its cocaine and for having the longest armed internal conflict in Latin America. After 52 years of conflict, an estimated 250,000 people have been killed, six million internally displaced, and according to the Migration Policy Institute roughly one in ten Colombians is living abroad – that’s over four million. Colombia is the eleventh highest country on the GINI index meaning it is one of the most inequitable - measured by income disparity between the richest and the poorest – in the whole world. In other words, Colombia is neither a common nor logical destination for those fleeing violence and looking for stability and economic opportunity. But Almotaz didn’t care about all of that, he moved to Colombia for love. After over a year, they decided they had to meet in person and determine if this relationship could be serious, so they met in Turkey for a week. Sure enough, he explains, they fell in love and began making plans for Jessica to move to Syria. At this point the civil war had just begun and they thought it would be over soon enough. But when his family’s business was bombed and he would soon graduate and no longer be able to avoid his military service, he decided Syria was too unsafe, so he would go to Jessica instead. Several miracle-like encounters, some generous donors, a marriage administered over Skype, and over a year later, Almotaz made it to Colombia in early 2014. Almotaz’ reason for coming to Colombia is unique, but he is not the only recent refugee from the Middle East in Colombia, or even the only Syrian. Caritas Colombia is a Catholic NGO that helped Almotaz when he first arrived. The United Nations High Commissioner for Refugees (UNHCR) – the entity that sets up refugee camps all over the world – has an office in Colombia, but the vast majority of their programming focuses on the millions of internally displaced Colombians, not refugees from abroad. UNHCR provides grant funding to Caritas to support the relatively small number of refugees. Caritas is currently providing support to three Afghans, a Turkish family of five, an Iraqi family of four and five Syrians who have all been granted asylum. They have all arrived in the last six years. After fleeing Syria, Almotaz spent six months working in Turkey and struggling to save any money for his trip when finally a friend and fellow Syrian in Istanbul offered to buy him the ticket. The man had simply developed a soft spot for this unexpected love story. All he wanted in return was that Almotaz continue being a good Muslim, and in so doing, show the people of a very far away country the peaceful and loving ways of the Muslim faith. Once again, that part of Almotaz’ story is quite remarkable but the next part is very common. In order to reach Colombia, Almotaz had to fly through countries that did not require visas for Syrians. His final trip took him from Istanbul, to Abu Dhabi, to Rio de Jeneiro, to Quito. His now wife Jessica, met him in Ecuador and they crossed into Colombia by bus. At the Caritas Colombia offices in Bogotá, the security official, Ernesto Zamora, shows me a map with the most common routes and easiest points of entry for illegal migrants along Colombia’s southern borders with Brazil and Ecuador. He explains that sometimes they enter alone by foot or by bus, other times they pay smugglers to take them in. He shows me a chart that shows the recorded number of migrants who entered Colombia in 2015. The numbers in this column for Afghanistan, Turkey, Iraq and Syria were all higher by a few than the number that the organization reported to be supporting in Colombia (the numbers listed above). When I asked Ernesto why, he showed me another map. This one shows the various established routes that migrants take to leave Colombia heading to North America where most of them hope to settle. Those who go by boat are often smuggled in container ships, Ernesto tells me. Many migrants from the Middle East and elsewhere pass through Colombia, and some just end up staying, they don’t really know why. Ernesto’s Colleague, Laura Echeverri, tells me that the Colombian government has granted asylum to all of those from the Middle East that Caritas has helped with the application process, but offers them no financial support. On top of that, the application processing time normally takes about a year, and in the meantime, asylum seekers are not allowed to work, “which makes the settlement process really difficult for them,” Laura says. Caritas offers some small financial assistance but with a limited budget, they must prioritize women and children first. “We are up to here,” Laura says, signaling to her chin – the universal sign for being completely overwhelmed, and in this case, underfunded. Almotaz is one of the lucky ones who received roughly $250 per month from Caritas during his first year in the country. That’s the equivalent of Colombia’s minimum wage, but was not enough for him to support his family. He was happy to finally be reunited with his wife, but settling in Colombia was not easy for him. He didn’t speak the language, he hadn’t finished his degree in Syria; he faced an uphill battle. 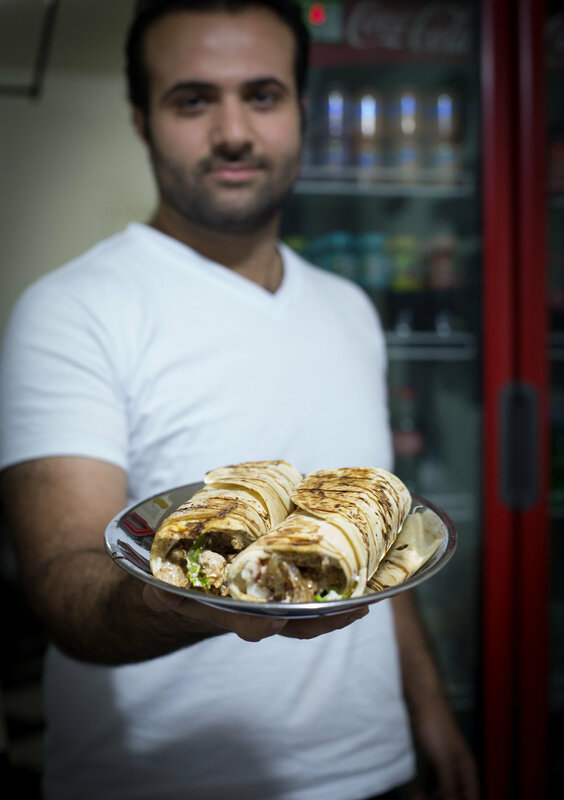 Everything changed for him when his mother suggested he sell Syrian food. For four months straight, Almotaz Skyped with her every night so she could teach him to make dishes such as shawarma and falafel. Caritas helped him buy a food cart and he began selling foods that were completely foreign to the locals. Soon Almotaz began learning Spanish very quickly as he charmed and conversed with his customers. After a year with the food cart he and Jessica found a nearby vacant storefront and a landlord that didn’t require a credit history in the country. Now he even has a second location. Almotaz (far right) and his team of three employees. Almotaz is doing well, but he explains that for him and the other Syrians he knows in Colombia, adjusting to the culture is difficult, “For example, the people here love to drink and listen to loud music without caring about the neighbours.” He doesn’t like that he’s always worrying about his wife walking around alone because it is “so dangerous and there are lots of robbers” in Bogotá he says. He explains it’s not easy being the only Syrian around, and some people have even made jokes about all Arabs being terrorists. He also wishes that the government would offer the same support that one of his brothers is getting in Germany: healthcare, a stipend and an apartment. Despite all this, Almotaz was laughing and joking around with his three employees when I first walked in, and later while he prepared my shawarma as well. They all call him “Mo-mo”, and each of them tells me that before working there they were all just customers who loved the food. Some other neighbours drop by during the hour that I’m there just to say hello. He has his complaints about the country, but he also says he loves it and that his latest project is raising funds to bring his younger brother to Bogotá from Damascus. When I thanked him for his time, he replied with a huge smile, “No problem. Everything with love.” He is still a practicing Muslim, and from what I can tell, he is making good on his promise to share his faith, but mostly his loving personality, with Colombia.